After Thanksgiving is when the NFL season really kicks it up a notch in terms of intensity, at least for the teams still in playoff contention. With five weeks left in the regular season, there’s no reason to hold back anything in reserve. It’s go for broke, make your move time, and that usually makes for great December drama. My game of the week in Week 13? That’s easy. Minnesota (9-2) is at Atlanta (7-4) and I can’t ever watch those two teams play without thinking back to their epic 1998 NFC Championship Game in the Metrodome, when I was the Vikings beat writer for the Minneapolis Star-Tribune. That 30-27 Atlanta upset victory in overtime was still the most memorable game I’ve ever covered, when the 15-2 Falcons did the near-impossible in rallying from a late-game deficit to force sudden death and vanquish 16-1 Minnesota. If we get half that game this Sunday, we’ll be fortunate. But with the Vikings on a seven-game winning streak and the Falcons having righted their season by winning three in a row, this matchup has both glamor and the potential to greatly impact the NFC playoff chase. Minnesota is currently the NFC’s No. 2 seed, with Atlanta in the No. 6 slot. But there’s still time for that to change. Nineteen years later, Vikings-Falcons is must-see TV once again. Washington at Dallas — The Cowboys have been beyond anemic offensively without Ezekiel Elliott, with no one deluding themselves into thinking Dak Prescott can carry the load by himself any more. Washington’s Kirk Cousins isn’t playing like his team is all but out of the NFC wild-card chase, and he likes to show up in prime time. Winner: Washington. Kansas City at the New York Jets — Herm Edwards used to coach both of these teams, and now it looks like he’s getting back into the game, as the favorite to take the vacant Arizona State job. The reeling Chiefs couldn’t beat the Giants at MetLife Stadium two weeks ago, but their luck will finally turn for the better in JetLife Stadium. Winner: Kansas City. Tampa Bay at Green Bay — There are some easy Bay of Pigs jokes to be made with both of these teams under .500 after 12 weeks. But after watching Brett Hundley and the Packers almost knock off the Steelers in Pittsburgh last Sunday night, they don’t deserve the ridicule. Winner: Green Bay. Minnesota at Atlanta — The Falcons offense has looked 2016-esque of late, and no longer are Atlanta fans calling for the head of first-year coordinator Steve Sarkisian. Mike Zimmer was once Atlanta’s defensive coordinator and he’ll have his guys amped up to appropriate big-game levels. But the Falcons are putting some things together at the right time, and Minnesota’s winning streak is about to come to an end. Winner: Atlanta. San Francisco at Chicago — Hard to factor in the first-time Jimmy Garoppolo start in terms of how much improved San Francisco’s offense will be. Chicago’s defense could make a play or three to boost the Bears, but Mitchell Trubisky still has those training wheels on his game, and the 49ers should hang up win No. 2 of the year. Winner: San Francisco. Detroit at Baltimore — The Lions haven’t won a game in Baltimore since the Colts were the home team and Bert Jones wore the horse shoe on his helmet. If the Lions are to have legit hopes of making the playoffs, this is a must win. But the Ravens will scrape together another ugly win and take a firmer grip on the AFC’s No. 6 seed. Winner: Baltimore. Denver at Miami — Dolphins Head Coach Adam Gase used to be Denver’s offensive coordinator, but his team now has lost five in a row, its longest skid since 2011. Broncos Head Coach Vance Joseph used to be Miami’s defensive coordinator, but his team has dropped seven straight, its longest losing streak since 1967. The tiebreaker? Miami quarterback Jay Cutler is back, and he started his NFL career in Denver. Winner: Miami. Indianapolis at Jacksonville — Man, was that one weird Chuck Pagano press conference the other day. Between him and Colts owner Jim Irsay, their trains of thought left the tracks long ago. I don’t believe we’ll have too many more Pagano press conferences to enjoy/endure, and another loss this week against the Jaguars will hasten that reality. Winner: Jacksonville. Houston at Tennessee — Houston hung up 57 points the last time these teams met, in Houston in Week 4. But that was Deshaun Watson time for the Texans, and sadly the rookie quarterback is done for the year with an ACL injury. Tom Savage is a turnover machine, and the Titans will continue their bid to win the AFC South for the first time since 2008. Winner: Tennessee. New England at Buffalo — Tom Brady is 26-3 against the Bills in his career, more wins than he owns against any other team. Can you imagine? Buffalo has only beaten Brady three times in the span of 17 seasons? Number four is not forthcoming. Winner: New England. Cleveland at Los Angles Chargers — Last year the Browns beat the visiting Chargers in Week 16, earning their only victory of the year and avoiding the ignominy of 0-16. That’s still the only win in Hue Jackson’s tenure, with his 1-26 mark growing more historic by the week. The surging Chargers won’t let it come down to a field goal once again, and the Browns will be dealing with an 0-12 reality. Winner: Los Angeles. Carolina at New Orleans — The Saints already went into Charlotte and beat the Panthers in Week 3, meaning this game could wind up deciding the NFC South champion. If they couldn’t slow down the Saints at home, I don’t see the Panthers getting it done in the Superdome. Winner: New Orleans. New York Giants at Oakland — After the way the Giants botched the Eli Manning benching, playing 3,000 miles away from their fan base seems prudent. Good luck, Geno Smith. This is a New York team that wouldn’t always play hard for the face of the franchise in Manning. You’re probably not getting their best effort either. Winner: Oakland. Los Angeles Rams at Arizona — I have to admit I kind of miss the days when Bruce Arians and Jeff Fisher would snipe at each other through the press. Those Rams, as Arians liked to remind everyone, were always 8-8. These Rams are 8-3, and bear no resemblance to the old Rams. Winner: Los Angeles. Philadelphia at Seattle — The high-flying, quick-to-dance Eagles haven’t been tested in over a month, winning four straight games by at least 23 points. Another blowout isn’t happening. In fact, this is near desperation time for Seattle, and the Seahawks are going to rise up and remind the rest of the NFL to not forget about them. Winner: Seattle. Pittsburgh at Cincinnati — If I’m Bengals coach Marvin Lewis, I’m making sure my team sees that Mike Tomlin-Tony Dungy interview from last Sunday night on a continuous loop. The Steelers might be looking ahead to the Patriots, but they’re still good enough to do so while taking care of business against Cincinnati. Winner: Pittsburgh. 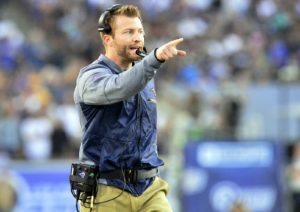 Rams Head Coach Sean McVay is doing such a good job that we are well past talking about their ‘potential’ – the Rams are here now, and they are a legitimate Super Bowl contender because McVay continues to perform well. And we don’t even want to mention his age, because, well, it’s irrelevant. He’s simply a very good coach, and on the way to showing he’s a great coach. This was the marquee game of the week, with McVay matching wits against another of the NFL’s best in Saints Head Coach Sean Payton, and McVay came out firing. On offense, the Rams’ tempo was terrific all day long. Not only did McVay vary formations, but he varied the tempo, which is hard to do with such a young QB in Jared Goff. He made sure to get young players such as backup WR Josh Reynolds involved early. The Rams scored on their first possession, and never looked back as McVay went right at the Saints’ backup corners repeatedly. The Rams defense gave a stellar performance as well. McVay yields completely to DC Wade Phillips, and wisely so. With good offensive and defensive units, Rams practices certainly must elevate the focus and quality of the entire squad. The Rams wisely retained Special Teams Coordinator John Fassel when they hired McVay. Their return units, punter, and kicker all contributed to this win. When you watch a Rams game, you see a tight operation. When they play, you don’t see a lot of “loose threads” (wasted time outs, bad penalties in key situations, wasted special teams opportunities in flipping field position, etc.) It’s a mark of a well-coached team. Even in their loss at Minnesota the previous week, the Rams did not play well, but they still pushed the Vikings hard. This is a team that will contend consistently. They’ve been among the most fortunate teams in the league on the injury front this season, but that isn’t the primary reason they’re good. 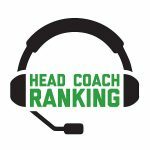 The primary reason is Sean McVay, Week 12’s Top Dog. For the second week in a row, the Situational Call of the Week cost a team the game. The Jacksonville Jaguars took hold of the AFC South after the Tennessee Titans lost to the Pittsburgh Steelers the week before. The Titans won a key game against the Colts on Sunday, all Jacksonville had to do was not lose. Instead, Jaguars Head Coach Doug Marrone “got too greedy” as he put it in his play calling near the end of regulation. On paper it wasn’t a challenging win for Jacksonville, but Arizona came to play. They found success on offense with quick inside passes, and on defense by pressuring QB Blake Bortles, shutting down the rushing attack, and matching WR Marqise Lee with CB Patrick Peterson. This game plan put the Cardinals up 13-3 at half. Marrone’s aggressiveness started with 7:30 left in the 3rd quarter at the Cardinals 1-yard line. On a 4th and Goal and trailing by 13, the Jaguars decided to go for it and they converted for a touchdown. This made it a six-point game. Jacksonville would score another touchdown on a 10-yard fumble return to take its first lead in the game. The Cardinals came right back and scored a TD and successfully converted a 2-point attempt. Jacksonville scored the game-tying TD after a 68-yard kickoff return gave them a short field to work with. T.J. Yeldon rushed for two yards on first down, but the Jaguars passed on both 2nd and 3rd down. The 3rd down pass came on a 3rd and 6 with 2:47 left in the game on the Arizona 38. Blake Bortles rolled out to find WR Marquise Lee but was intercepted and gave the Cardinals the ball at their own 40-yard line with more than two minutes. Ultimately, the Cardinals were able to get into K Phil Dawson’s range and won the game off his boot. In our view and Marrone’s hindsight, it wasn’t the best call to attempt another pass play, although it wasn’t wise of Bortles to try and fit the pass into a tight window. Looking at the game as a whole though, Lee was shut down by the Cardinals secondary (1 reception, 13 yards). So targeting him on a crucial pass play with the game on the line wasn’t the best choice. We don’t know if Jacksonville would’ve won the game either by kicking a FG or taking it to overtime. What we do know is that they didn’t win because of unnecessary aggressive play calling. 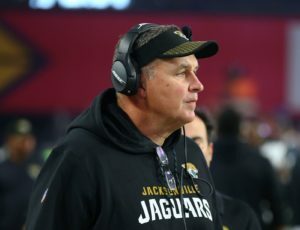 Marrone’s decision to pass cost the Jaguars a chance to sit atop the AFC South alone, and that is why it is this week’s Situational Call. Key Decision #1 – After the Texans opened the game with an impressive TD drive to go ahead 7-0, the Ravens faced a a 4th & 6 at the Houston 40. The Ravens called for P Sam Koch to fake the punt and pass the ball, and he made a nice throw for a completion, which ultimately led to a tying TD. Key Decision #2 – With the score tied 7-7 in the first half, the Ravens faced at 4th & 1 at the Texans 37, Ravens Head Coach John Harbaugh opted to go for the first down. With an offense challenged to score points all season, we felt this was a prudent decision as the Ravens have a very good defense, and were facing a backup QB in Tom Savage. The Ravens converted for a long run that led to a short TD and a 14-7 lead. Manufacturing Offense Works Sometimes, But Can It Last? – This game was primarily won with the help of two key decisions by Ravens Head Coach John Harbaugh, a fake punt call and the decision to go for 4th & 1. Punter Sam Koch also contributed with terrific pooch punting all night. QB Joe Flacco threw for only 141 yards, and the Ravens did not have a 100 yard rusher. But there are other ways to help your offense, and Harbaugh proved it tonight with special teams, gutsy 4th down calls, and a good punter. But how long can they sustain this? Key Decision #2 – On 4th & 9 on their own 26 on the opening possession of the game, the Patriots called and executed a fake punt for a first down. They kept the ball, marched down the field for an opening TD, and never looked back. Special Teams are called ‘special’ for a reason – We don’t know if the Patriots’ fake punt call came from the bench, or if protector Nate Ebner was empowered to make the call on his own, but either way, it was a brilliant pickup by Bill Belichick’s staff, and completely altered the tone of the game. The Dolphins had shut the Patriots down on the first three offensive plays of the game, and their defenders left the field giddy. They had to come back on the field and couldn’t hold, and the entire tone of the game changed as the Patriots’ fans were back into the game. Gase’s 4th Down Dilemmas – Down 14-0 near the end of the first quarter, Gase faced a 4th & 1 on his own 46. He went for it, and got the first down, and we felt this was the prudent call. We liked his aggressiveness here. However, down 21-10 in the 3rd quarter, and on their first possession of the half with a chance to close to within one score, Gase had a 4th and inches – perhaps eight inches – on his own 33. Gase chose to punt. The Patriots promptly marched down the field for a TD and their first three-score lead of the game. We felt Gase’s better option was to try and pick up the eight inches because at that point in the game, the Dolphins defense hadn’t had any luck stopping the Patriots. If he had failed to gain the eight inches, it would have made no material difference for the Patriots to get the ball at the Dolphins 33 or the Patriots 23. But if the Dolphins had gained the first down, and could have closed to within one score, the entire tenor of the game would have changed. Gase also had a couple of other interesting 4th down judgments. Down 28-17 and with 4th & 11 on his 35 yard line with 8:48 minutes left, he switched to being aggressive again and decided to go for the first down. He didn’t get it, the Patriots got the ball back, scored a TD and led 35-17. Later, down three scores with about five minutes left and facing a 4th & 17, however, Gase chose to punt. High Winds Or Practice During A Live Game? – Bill Belichick also had an interesting judgment call, aside from the fake punt. Up 28-10 at the start of the 4th quarter, the Patriots faced a 4th &1 at the Miami 25. Belichick passed up a 42 yard FG attempt and went for the first down, but did not get it. We felt this was a curious decision. It could be that the high winds caused him to pass up the FG, or it could be he wanted his team to get more live reps in a short yardage situation because they have not been a good short yardage team thus far this season.